It is hard to build a life around the missing pieces of the heart. 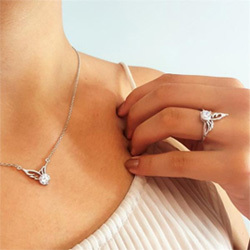 This lovely angel jewelry set will be a constant reminder of the unsevered bond you share with your loved one. In it, you will find comfort in knowing that someone so special will never be forgotten. I love my new necklace and key chain!! I have worn the necklace non-stop since it arrived and get compliments on it ever time some one sees it! I bought an extra key chain and surprised a friend who is also a widow, it touched her so much that it brought her to tears and she immediately put her keys on it. The quality and clarity of both items are fantastic!! My brother and sisters and I love them. Both are parents have passed so that why I bought them for us! This jewelry will make beautiful Christmas presents for my very close friends. Bought as a gift and recipient is thoroughly thrilled to tears with the sentiment and quality.